What is solar for all? For nearly two centuries, Appalachia has powered America with energy—from coal to oil to gas. We are the backbone of the American economy. But the world is changing all around us. We need safe, reliable energy that builds wealth here at home. Solar energy is the opportunity Appalachia has been waiting for to rebuild our towns and diversify our economy. It is vital that the benefits of solar reach every West Virginian. Installers put panels in place at the Shepherdstown Presbyterian Church. We work to expand solar access in diverse West Virginia communities. We work closely with community groups, churches, municipalities, and non-profits of every stripe to build programs and projects that make solar affordable and accessible. One of the ways we’re doing this is by supporting Power Purchase Agreements (PPAs). PPAs are a widely used financing mechanism for solar projects. They are a contract between a third-party developer to install, own, and operate a solar array on a customer’s property, and the customer who agrees to purchase electricity produced by the array at a fixed rate. This fixed rate is typically lower than what the customer pays to the local utility company. These contracts are set for a specific time-period, usually 15 years. PPAs are legal in 26 states, including Virginia, Ohio, Pennsylvania, Maryland, and Georgia. In addition, solar PPAs will expand economic development, create good local jobs, and attract employers to locate and invest in West Virginia. Click here to urge your legislator to support PPAs in West Virginia. 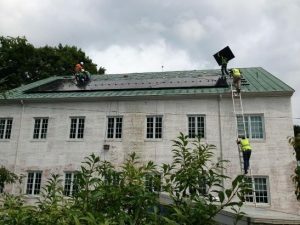 Solar discrimination against non-profits and businesses -West Virginia’s businesses, churches, and nonprofits get paid 60 percent less for their solar electricity than a homeowner next door. This isn’t fair. We put together a paper that details the problem and the solution. New Vision Renewable Energy – A nonprofit located in Philip, WV, New Vision works locally and globally with faith-based and community organizations to get renewable products into the hands of the people who will benefit the most. They organize time banks and community “barn raisings” to help low-income families go solar and save on their electric bills. Check out our detailed profile of New Vision Energy’s work in West Virginia.